What looks like a standard Wit, turns out to have a great deal of flare. 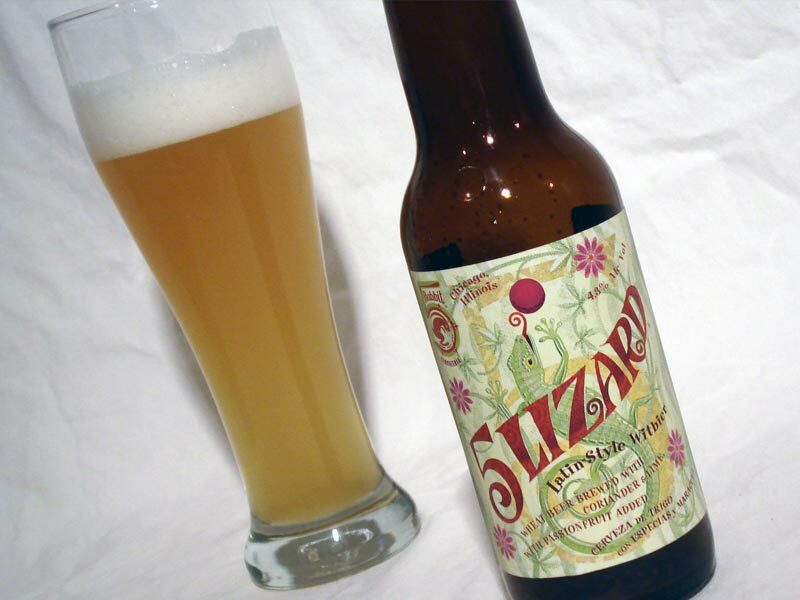 When poured, this beer possesses a fluffy egg-shell white head atop a hazy straw-golden liquid. There is a good deal off yeast at the bottom so make sure you swirl the bottle well before finishing the pour. It will provide a very creamy dense foam on top. Looking at it a little longer it had a close resemblance to a Berliner Weisse. Brewed with coriander seeds it breaks from tradition by forgoing the use of dried orange peel for lime. Moreover, passion fruit was added to give a very interesting dimension to this beer. I understand that some do not like fruit in their beer and I can respect that. I first was introduced to this beer at a tasting event and thought it was rather fruity myself. However, giving it a second try I found it to be refreshing and unique. Here is why. Witbiers are essentially thirst quenching in nature. The spice of the coriander and citrus notes of the orange help to provide some flavor to a rather dull malt bill. 5 Lizard takes that approach and puts a tropical relaxing twist on it. The lime made me think I was on a sandy beach and gave a little more of a tart and tangy flavor than the dried orange peel. However, the passion fruit gave great tropical notes. Surprisingly, it had a very similar taste to those big juicy citrus IPAs without the use of all the hops. Hints of guava, mango, lemongrass, pineapple, and papaya washed over my palate. The mouthfeel is on the lighter side, but with some body due to the wheat. This beer is perfect for those super hot summer nights.